Dreams are what we aspire to achieve, but their very existence is tenuous at best and can be destroyed in an instant. The nightmare sits ever present, right beside the dream, ready to pounce and tear it apart. Which brings us to Thursday night in Knoxville, Tenn.
Tennessee was looking to rise back to national prominence for the first time in more than a decade and instead showed America that it was not ready for primetime or even for the 3:30 time slot. Simply put: the Volunteers looked bad against Appalachian State. The Vols were beaten up on both sides of the line throughout the game. Tennessee was aided by a missed PAT, a missed field goal, and whatever you want to call App State’s clock management in the fourth quarter. They needed a forward-bouncing fumble in overtime to pick up the W over a team they were favored to beat by three touchdowns. 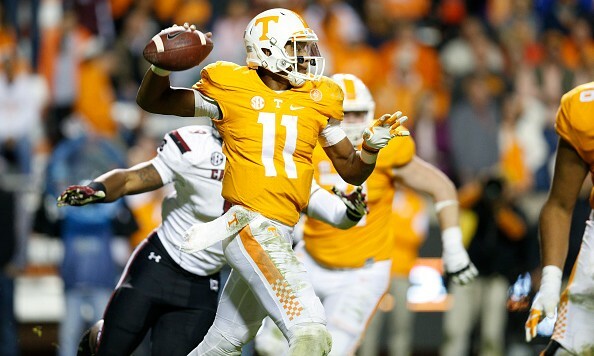 Josh Dobbs looked mediocre at best at quarterback. He’s a skilled player, but he never really clicked. Cameron Sutton muffed a punt to set up a touchdown, and Jalen Reeves-Maybin got a quick exit after being ejected for targeting. This didn’t look like a good team that forgot to wake up against an inferior team; this looked like an average team just trying to hold it together. Jalen Hurd was one of the few consistent bright spots for the Volunteers with 110 yards and a score at tailback. The most telling moment came late in the first half, a good 30 minutes after the Vols had an apparent touchdown wiped off the board for failing to complete a catch, ESPN sideline reporter Laura Rutledge reported that the team was still talking about it on the sidelines. If a bad call early in a game against Appalachian State gets into Tennessee’s head what happens when Florida slaps them hard? What’s the reaction when Georgia or Alabama get rolling? Tennessee hasn’t won 10 games in a season since 2007, which was four coaches ago. This team was the one to get everything going back towards the era when Tennessee was must-see television. But the team that escaped with an OT win over the Mountaineers is eight wins at best, and if the Vols get eight, it would be the first time the win total has dipped in the Butch Jones era. Last year, Stanford was in a worse spot, coming off an opening-week loss to Northwestern, and turned it around in a Rose Bowl year and produced a Heisman finalist. There is still time for Tennessee to turn it around, and they have a huge opportunity to make a solid impression next weekend at Bristol Motor Speedway against Virginia Tech. However, this team looks too flawed to reach the upper stratosphere of college football. So there sits Tennessee’s nightmare, crouched ever so close to the dream that’s been building for months, and it’s sitting there confidently.